We would be delighted if you would join us on June 11th at 2.30pm for a ground breaking ceremony with Fiona Bruce MP at the site of the new Scout Hut and Youth Centre, to celebrate the beginning of the building of our new community facility and help us raise a glass in thanks to everyone who has helped us make this project come true. 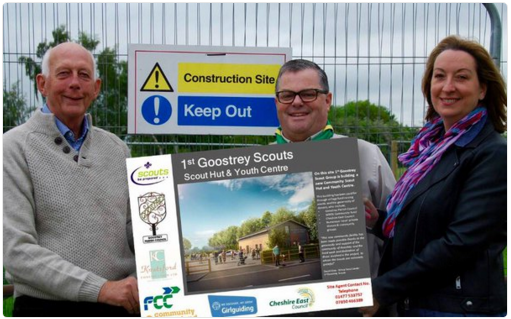 I am delighted to be able to tell you that Goostrey Scouts have been given two generous grants towards the cost of building the new Scout Hut and Youth Centre, one from Goostrey Parish Council for £50,000 and another from WREN Community Fund, also for £50,000. As a result of these grants we have now raised £200,000 of the £250,000 needed to build the new facility and have signed a contract with local builders Knutsford Construction, who will begin building the Scout Hut and Youth Centre next month. The building work is planned to be completed in February next year, which leaves us seven months to raise the remaining £50,000 to complete the project. This entry was posted in Scout/Youth Centre. Bookmark the permalink.